Being invited to a ceremony in this storied location to open one of our projects reminds me what a privilege it is to work at the Inter-American Foundation (IAF). I joined the TIERRA team to launch and discuss project activities with the communities and with the municipality. The agenda was set for a small formal ceremony in the indigenous leaders’ center. However, the communities and the municipality were so excited about the project’s approval that they asked to make a slight change and move the location to the Spiritual and Political Centre of the Tiwanaku Culture. The communities wanted to perform a special ceremony for the opening of the project to demonstrate the commitment of the indigenous, municipal and community leaders to work together and see the project to success. This is really about how much the communities and local government respect TIERRA. It demonstrates how the organization built a strong relationship with their last project, which focused on land titling and registration. For that project TIERRA facilitated conflict mitigation to resolve intense personal, familial and community conflict around land. One of their strengths as an organization is their ability to maintain and strengthen their relationships after a project is over. Only the community leaders can elect to hold a ceremony on the grounds of what they consider one of their most sacred spaces. They rarely invite outsiders to participate. That TIERRA and the IAF were so honored is a once-in-a-lifetime event. This was not just a simple Bolivia formality. 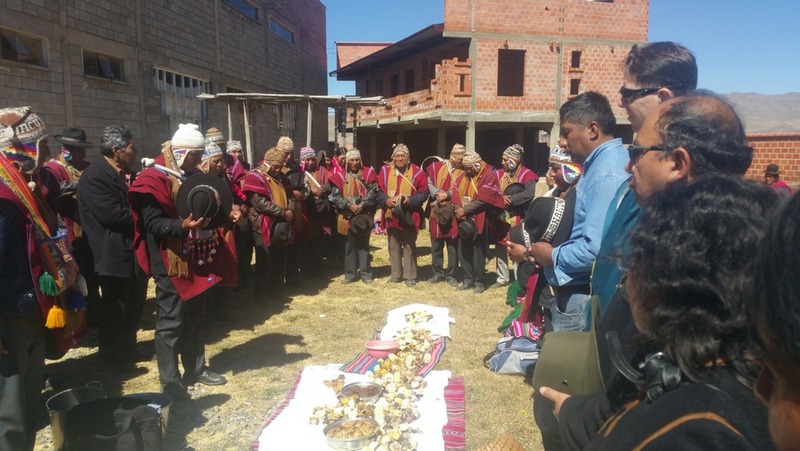 It was a public commitment that all leaders and representatives of the 23 communities that make up the municipality of Tiwanaku agreed to implement the project. Every leader from every community attended. In front of everyone, they signed the agreement between TIERRA and the communities and asked that the IAF sign as well. These public demonstrations of commitment will be hard to break and go beyond normal expectations for the culture. This public commitment will be a huge part of what TIERRA relies on to make sure citizens participate in project activities and have a say in decisions and policies that affect them. Communities will engage with their municipal authorities to improve access to information on land use, land tenancy, agricultural census and other data. They will strengthen member participation in municipal economic commissions and other public forums. Rural producers, empowered to participate in shared decision-making, will be able to advocate more effectively for greater investment in local agricultural development projects. Community development at this level has a cascade effect. Bolstering the capacity of community groups to propel their own development strengthens local governance, promotes inclusion and advocates for government accountability and transparency. Civil society members will have a say in expanding economic opportunity through investments in sustainable smallholder agriculture, urban and rural micro and small business growth, and local entrepreneurship and market development. Ultimately, the goal is to enhance peace and security by strengthening the social and economic fabric of the communities. The IAF has a long history in Tiwanaku, having supported the creation of the first rural university (Universidad Autónoma Campesina, or UAC) in the early 1980s. We met Padre Claudio, who has been the priest in Tiwanaku for over 40 years. He talked about how the IAF helped transform an idea the community had into reality. We also helped connect community leaders to different embassies and other donors to continue their work. Now, 35 years later, there are UACs throughout the Altiplano region. Both the mayor and ayullu leader, or indigenous president, of Tiwanaku (among many others) are products of the university. When they discovered that the IAF had helped start the university, it added another layer of interest and energy in what was already an exciting event. Our small investment has helped thousands of people and created leaders who demand and practice democracy and advocate for greater transparency while truly representing their communities. TIERRA’s project builds from this history and the current reality. Our successful relationship with this community demonstrates our value as an agency to support innovation and provide the fertilizer (organic, of course) to the seeds of ideas and the solutions generated from the grassroots that transform civil society. I’m honored to have attended.